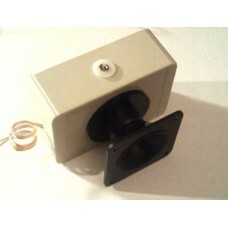 Powerful 130dB Air ULTRASONIC TRANSDUCER in an Enclosure. This is our most Powerful ULTRASONIC AIR TRANSDUCER, boxed in an Enclosure. Frequency range is 5kHz - 25kHz, and it can be powered directly by our Dog Bark Deterrent, or 100W Ultrasound Generator, or Sonic Nausea device. Produces up to 130dB Sound Power at frequencies below 10kHz, and is most effective up to 19kHz, with lower output at frequencies above that. Is about 20dB more powerful than our 100W Air transducer. Has a 1/4"-20 camera mount so that it can be put on a tripod. Can also be placed on top of the Dog Bark deterrent, and if you purchase it at the same time with the Dog Deterrent, it'll be plugable into the deterrent unit. So for the HIGHEST POWER for deterring barking, you'll want this Boxed transducer PLUS either our regular Bark Deterrent ($111.95), or the one with Adapter ($122.95), which can be fitted with our 10" long range horn. "Jaro, I'm actually having pretty good luck at 170 yards with the existing setup. " "Hi Jaro thanks for your tips and patience. My new dog bark deterrent works in all directions even through two fences and heavy hedges , in less than a minute. I believe I'm the big dog in the neighborhood now. Mark B.
PS there are 12 dogs living nearby."